"one of the least thought of vital accessories for a telescope"
Anyone who walks out of Company Seven's showroom with their new telescope will often hear someone murmur "he'll be back, they all come back". This is because a telescope is just the base price of admission to our universal hobby but it will be the accessories, or necessities, that will dictate what the person can see or do with the telescope. So sooner or later they will be back to buy this or that, to see or photograph a planet or the moon or the deep-sky wonders even better. While our customers usually seek our advice about accessories for their telescopes, carrying cases are one of the least thought of vital accessories for a telescope. We hardly ever hear anyone asking for our advice about these, but they are vital since cases protect sometimes very costly items from damage and misplacement. 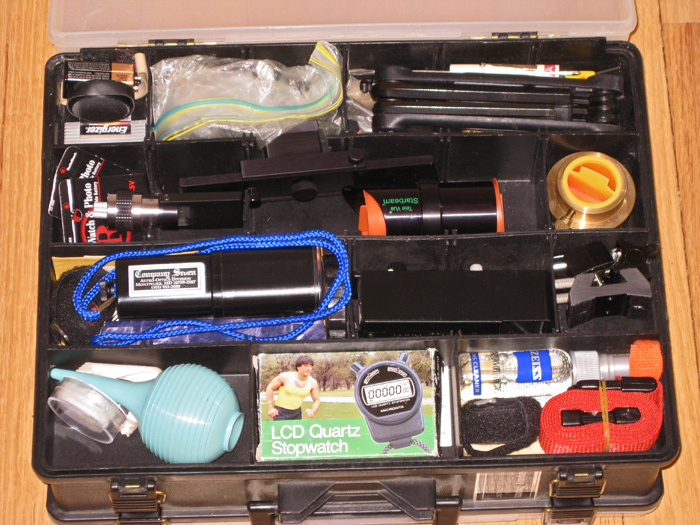 A well organized layout of the accessories within a case facilitates knowing at a glance what items are close at hand even in the dark. 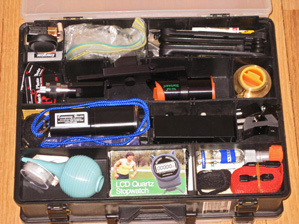 By having all the accessories in a case it is a quick and easy matter to take the telescope out with all these neat add-ons, after all can you imagine driving an hour to a good dark sky site only to realize you forgot this or that at home? So we view carrying cases as being among those few necessities, but not ones that should cost too much - at least for starters. So now that we know to buy one then where do we go from here? Company Seven recommends our customers consider a reasonably sized hard shell plastic case (often referred to as an 'organizer') with a transparent lid for storing and transporting smaller telescope accessories. 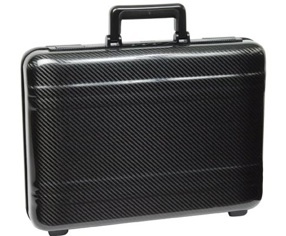 The case should have compartments deep enough to accommodate the largest accessories your telescope might use. 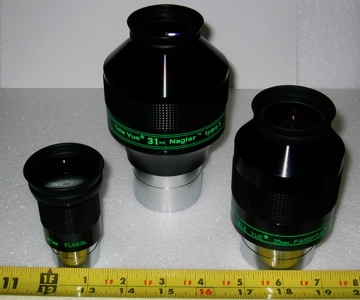 So for a larger telescope it should be able to accommodate the larger 2 inch diameter eyepieces, while a case arranged to support smaller telescopes may need fit only 1-¼ inch diameter accessories. 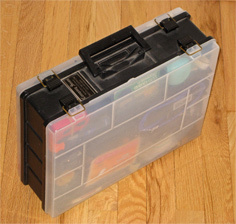 Fishing tackle boxes for example tend to have many small compartments, usually too small to accommodate the kinds of accessories we recommend. Oh, and what do we mean by reasonably sized? We mean it may be wiser to arrange your accessories into smaller and more manageable cases rather than to fit all into one large trunk. Use one or more cases that will be easy to move to pack into the confined spaces of vehicles for example. Right: TeleVue eyepieces from left to right 32mm Plossl 1-¼ inch, 31mm Nagler Type 5 ('TermiNagler') and 35mm Panoptic 2 inch models (35,553 bytes). Each are of similar magnification differing in the actual field of view they show and in how they deal with differing telescope designs. Click on the image to see enlarged view (77,267 bytes). By having a transparent lid one can recall at a glance what choices of gear they may have to use, and having the view makes it obvious that one may be missing something when a space is empty. You can set up separate cases to be specific to one telescope or a mount, or one case sharing accessories for several telescopes for example. These cases protect your valuable gear, make it easy to account for what is there or not, and make it easier to find items in low light too. For schools or other organizations using several telescopes in particular, well thought out cases facilitate organizing, set up, and control of inventory. Do's There is no absolute correct way to organize the interior of a case, do what works best for you while protecting the contents. One of my favorite examples of an accessory case is a double sided model shown below that I have used since the last visit of Comet Halley. I have arranged the case so that one side is open as the telescope is being set up, then the other side is open while observing. This case has seen decades of regular use, and even with no foam lining the contents of the case show no signs of wear or contamination. The case was purchased at a local hardware store for about $12.00. The partitions of the case are adjustable but some reinforcing walls are molded into the form. I cut openings in some partitions to better support the Starbeam sight. Small accessories can easily work their way into other spaces or even bind the hinge of a case, so I keep the smaller items within my accessory cases in a hard container or in a Ziploc™plastic bag. Above from left to right: an excellent case for small items is this generic double sided model as used to be sold at many hardware stores. Click on images to see enlarged views. cleaning equipment including our recommended Bulb Aspirator and Carl Zeiss Lens Cleaning Fluid and cotton swabs, a stopwatch for timing work, straps to secure expensive accessories attached to the telescope or to secure dangling cables, a Rigel Skylite 2 flashlight, Rigel QwikFinder, extra/spare quick release hardware, TeleVue Starbeam sight on quick release hardware mount as Company Seven provides, a heavy TeleVue Equalizer bronze 2 to 1-¼ inch adapter, spare batteries, a Ziploc™ plastic bag with spare bolts and washers, hardware and tools. a Brunton composite pocket transit (magnetic compass) and a high precision Suunto clinometer, 2 inch/48mm diameter nebular and neutral density and other specialized filters, 1-¼ inch color (two sets since I use a binocular viewer) and neutral density and other specialized filters, simple camera attachment hardware and video camera telecompressor, spare caps or covers, 35mm film canister with spare button size batteries, illuminated reticle eyepieces (sitting atop a cased SkyPointer green laser). Notice no eyepieces? That is because this case lacks enough depth and partition space width to accommodate 2 inch eyepieces. 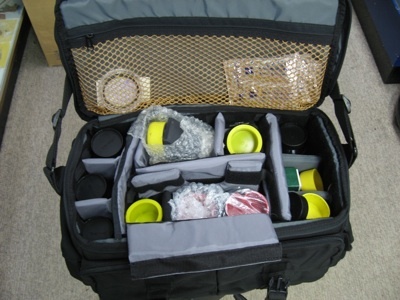 So to keep eyepieces organized together I use a camera bag (shown below) to store them. When I plan to use a telescope like my Questar 3-½ that has its own eyepieces stored within it's provided carrying case, then I need not take the large camera bag but I may carry my two sided plastic case to use the filters or other accessories within. Don'ts Company Seven has not endorsed any of the lightweight metal clad luan cases that were typically marketed to store camera and telescope accessories, these usually sold for $100 or less. Most of these are cheaply constructed and will not last long, particularly if exposed to high humidity over time. Often they have nailed on or glued metal channels forming sharp corner edges that can scrape car interiors or sensitive furniture. Fortunately, most of these cases are no longer made since better cases with rounded metal corners are now more common, if overpriced. Avoid cases that include soft cheap foam linings since these will deteriorate or spall in time. And especially if left in hot environments, such as in a car trunk over summer days, then some of the cheaper foams can literally turn to goo and melt onto your accessory. Some foams will off-gass and can deposit smears of goop onto your sensitive optics. So you may wish to shop for a more durable replacement lining, amazingly good foam insert panels can cost as much or more than the case! Note that even when Company Seven provides custom made Airline Transport Association (ATA) approved shipping cases with foam lined interiors, we have all the foam covered by hand with materials to prevent abrading accessories and to prevent these problems. These cases are not cheap, but then neither are the contents they are made to protect. 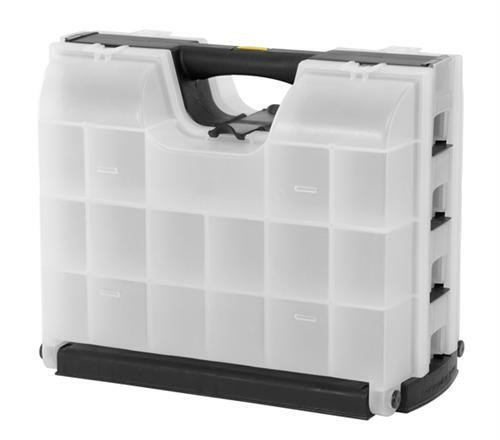 Above: Stanley® Model 014708R - Deep Professional Organizer (23,666 bytes). A case like the one above is one of the very few cases I have found that have enough space in the larger compartments to accommodate even our largest 2" diameter eyepieces. The plastic case is furnished with removable large deep yellow plastic cups so one can arrange the cups as desired - I prefer to load the heaviest eyepieces at the bottom of the case so that it stands better balanced its bottom edge for example. Each cup can be lined with layer upon layer of foam (found separately) that is cut to the desired form and depth to fit the accessory or eyepiece. 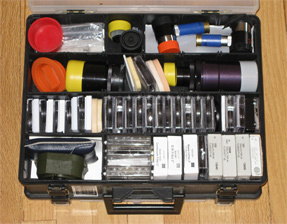 This can fit our Rigel Skylite 2 flashlight, 1.25 and 2" eyepieces, filters, etc. This case is lightweight, economical (about $15-20 in stores). But it is not highly protective and should be handled with care, certainly not a shipping case. 2. Stanley® Model 014166R - Double Sided Tool Organizer. Another candidate that is double sided and with greater capacity than the above case. Above: Stanley® Model 014166R - Double Sided Tool Organizer (23,666 bytes). The above plastic case is furnished with compartments that can similarly be lined with layer upon layer of foam (found separately) cut to the desired form and depth to fit a small or larger accessory or eyepiece. The partitions can fit our Rigel Skylite 2 flashlight, 1.25" eyepieces, filters, etc. This case is lightweight, economical (about $25 in stores). It too is not highly protective and should be handled with care - certainly not a shipping case. 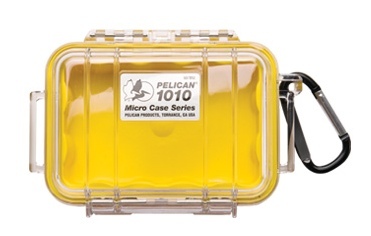 This case can be a better choice than the first case shown above if you buy a modular padded camera (see below) so that you keep the most sensitive items (larger eyepieces, binocular viewer, etc.) in the camera bag. While this organizer has space for many 1.25" eyepieces (that might be hard to find in the dark inside the bag below), filters, flashlight, lens cleaning gadgets, etc. 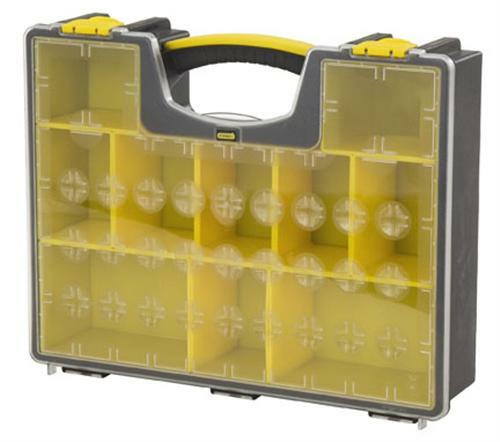 I use a case similar to this and have organized it so that one side has cleaning equipment bulb aspirators, brush, etc., spare nuts, bolts, Pole Finder telescope, spare batteries, spare nuts/bolts/knobs, small tools (Allen wrenches, etc.). The other side of my case is what I leave open for the observing session; this side houses eyepiece and nebular 1.25 and 2" filters, red flashlight, specialized illuminated reticle eyepiece with spare illuminators too, etc. If there is any problem with this case it is its space - it has so many compartments that you will want to buy just to fill them all - and maybe sooner than you had budgeted for! 3. 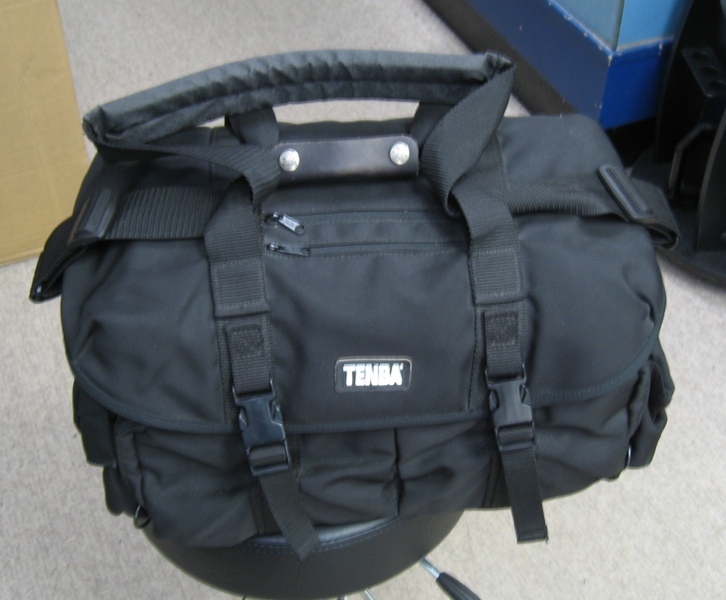 Tenba® Camera Bag For the most sensitive items I employ professional grade durable, modular camera equipment bags. One of the pioneers in making first rate bags is the Tenba® company; we still use them as the standard against which others are measured. In fact I have two of these, one is for visual accessories (eyepieces, etc. see below) while the second is for electronics including a Hand Control and Power Cord for my AP GTO Mount, Dew/Frost Prevention Control Box and heater elements. Bags like these can be spacious and padded well enough to protect binoculars too, though the less costly binoculars should be carefully carried since they are comparatively sensitive to shock and vibration. 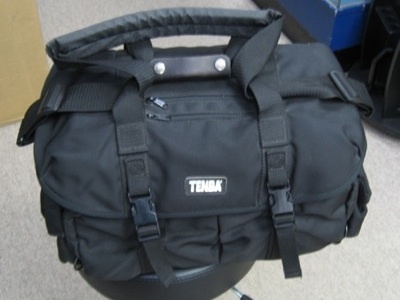 Above: Tenba professional grade camera bag with modular partitions. These bags are lightweight and easy to carry. The exterior does not mar my vehicles interiors, while the padded interior provides good protection from shock the elements for my prized contraptions. The interiors are modular with partitions held in place by Velcro. Since you are most likely to be protecting equipment that is or will accumulate to represent a sizable investment, Company Seven recommends you buy only the very best brands of these cases; do not price shop since cheaper cases are made cheaper! Oh, and suitably well padded bags may be put into larger well padded "ATA" Airline Transport Assoc. approved cases for shipping! The outer pockets house incidental items that are not terribly fragile (lens cleaning equipment and Carl Zeiss Lens Cleaning Cloths , charts, etc.). The interior houses large eyepieces, Astro-Physics 2X Barlow and a TeleVue Powermate Lens too, my Carl Zeiss / Baader Binocular Viewing attachment (in the case at the back left of center, you can just see it's attached diagonal with yellow cover). I doubled up the padded partitions surrounding the Bino Viewer for extra peace of mind; to do this I took partions that were not used in other bags to double up for sensitive items. Of course I use similar cases for other equipment including camera gear especially when access must be quick and ready. 4. Hard shell cases for some super expensive specialized gear (my DayStar Hydrogen-Alpha filter and Calcium K-Line filter for example) I use very well made custom padded aluminum cases by Zero Halliburton, and I also use waterproof plastic cases by Pelican™ and some of their small cases to protect particularly sensitive gear stored within larger cases. 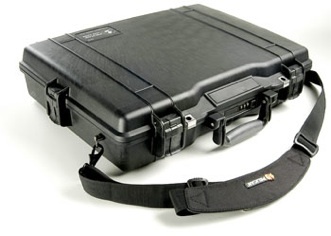 For larger items including telescopes I have ATA cases by Company Seven. Above from left to right: Zero Hallibuton carbon fiber case, Pelican™ plastic case, Pelican™ 1010y compact plastic case with D Ring. We hope this helps you spend wisely and protect that in which you have invested.